DT10 allows you to input the design value of period time and execution time at function property and step property. When you perform the Report Analysis, you can compare the result value of Test Report with the design value; so you will verify your design value. We will introduce how to verify the judgement result easily by using DTAdvisor. If there is a NG item in judgement, the “!” mark indicates in the folder view / module view. You can also check the NG item from folder view / module view, but if there are many registered source code, it may take time to check them by opening the tree. The “Error Test Point list” of DTAdvisor allows you to easily verify NG items since it shows the list of NG steps. Please open DTAdvisor by selecting [Tool] -> [Execute DTAdvisor] in the menu. At the time of opening DTAdvisor, Test Report is analyzed and display the list of error test point. It shows the list of NG steps. When you confirm the executed Test Point, DTAdvisor’s folder view allows you to check in tree structure. You can easily confirm the not-executed Test Point because of the tree structure. Please display a Test Report in DT10 application and open DTAdvisor. 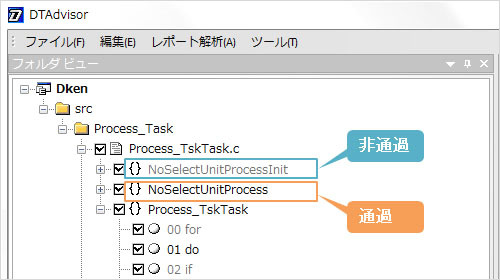 By opening DTAdvisor, Test Report is automatically analyzed, you can easily confirm the not-executed Test Point because DTAdvisor’s folder view / module view indicates that the executed Test Point displays in normal font and the not-executed Test Point displays in gray out font.